Intel first talked about its drive towards ultra mobility in April last year when it introduced the Silverthorne processors and the Menlow platform that would be known as 'home' for the new ultra-low power processor. Today, Intel has finally given the processor and platform a name – the two will be known under the Atom brand name, with the processor known as the Intel Atom processor and the platform known as Intel Centrino Atom. 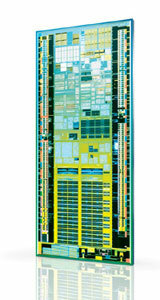 Silverthorne, or rather the Intel Atom processor, is based on an entirely new microarchitecture that is aimed at Mobile Internet Devices—something that Intel will be pushing heavily over the next year—but also manages to maintain compatibility with the Core microarchitecture's instruction set to ensure consumers get a familiar experience to what they would get on their home computer. The design includes multi-threading support (previously known as HyperThreading), which Intel says will allow for better performance and increased system responsiveness. Impressively, the Silverthorne die itself—which is packed with 47 million transistors—measures less than 25mm², meaning that you can fit eleven Atom processor dies in an area the size of an American penny. Silverthorne has a thermal design power specification of between 0.6W and 2.5W (yes, you read that right) and will scale up to 1.8GHz. At the higher-end of its power envelope, it will deliver roughly the same power as the original Pentium M processor at a fraction of the power. Confusingly, Intel has also introduced the Diamondville processors under the same brand name. The chip manufacturer hasn't talked about this chip an awful lot, but it's derived from the Silverthorne architecture and will be available in dual- and single-core versions. It's targeted at low-cost notebooks and desktop machines, known as netbooks and nettops respectively. According to DailyTech, the Diamondville-based Atom processors will first launch as a single core part at 1.6GHz, featuring a 533MHz front side bus, 512KB of L2 cache and a TDP of 4W. The Centrino Atom platform will feature an Intel Atom processor, an Intel 945GSE chipset—which comes complete with integrated graphics—and a wireless radio. Intel says that, "together, these components are designed to enable the best mobile computing and Internet experience on these new devices." You can expect to see devices based on the new Atom family coming in the second half of this year and I'm sure we'll be hearing more about Intel's MID plans out at this Spring's Intel Developer Forum in Shanghai, China. Do you think it's good that Intel has associated the Centrino branding with its new push for ultra mobility? Discuss in the forums. Intel has announced that it is now shipping the dual-core 45nm Atom processor that was quietly introduced at the Intel Developer Forum in August. We visited a few of the most popular hardware manufacturers here in Taiwan in the last few days to get the low down on what will be new on the Computex show floor for 2008.